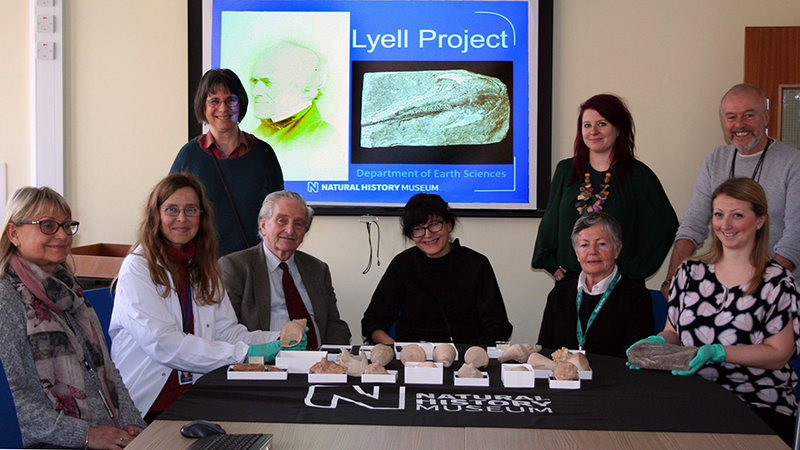 The Lyell Project team: First row, seated from left to right: Martha Richter (Principal Curator in Charge of Vertebrates), Consuelo Sendino (with white coat, curator of bryozoans holding a Lyell fossil gastropod from Canaries), Noel Morris (Scientific Associate of Invertebrates), Claire Mellish (Senior Curator of arthropods), Sandra Chapman (curator of reptiles) and Emma Bernard (curator of fishes, holding the lectotype of Cephalaspis lyelli). Second row, standing on from left to right: Jill Darrell (curator of cnidarians), Zoe Hughes (curator of brachiopods) and Kevin Webb (science photographer). Photo by Nelly Perez-Larvor. More than 1,700 animal and plant specimens from the collection of eminent British geologist Sir Charles Lyell – known as the pioneer of modern geology – were organised, digitised and made openly accessible via the NHM Data Portal in a pilot project, led by Dr Consuelo Sendino, curator at the Department of Earth Sciences (Natural History Museum, London). They are described in a data paper published in the open-access Biodiversity Data Journal. Curator of plants Peta Hayes (left) and curator of bryozoans Consuelo Sendino (right) looking at a Lyell fossil plant from Madeira in the collection area. Photo by Mark Lewis. The records contain the data from the specimens’ labels (species name, geographical details, geological age and collection details), alongside high-resolution photographs, most of which were ‘stacked’ with the help of specialised software to re-create a 3D model. Sir Charles Lyell’s fossil collection comprises a total of 1,735 specimens of fossil molluscs, filter-feeding moss animals and fish, as well as 51 more recent shells, including nine specimens originally collected by Charles Darwin from Tierra del Fuego or Galapagos, and later gifted to the geologist. The first specimen of the collection was deposited in distant 1846 by Charles Lyell himself, while the last one – in 1980 by one of his heirs. With as much as 95% of the specimens having been found at the Macaronesian archipelagos of the Canaries and Madeira and dating to the Cenozoic era, the collection provides a key insight into the volcano formation and palaeontology of Macaronesia and the North Atlantic Ocean. By digitising the collection and making it easy to find and access for researchers from around the globe, the database is to serve as a stepping stone for studies in taxonomy, stratigraphy and volcanology at once. Sites where the Earth Sciences’ Lyell Collection specimens originate. “The display of this data virtually eliminates the need for specimen handling by researchers and will greatly speed up response time to collection enquiries,” explains Dr Sendino. Furthermore, the pilot project and its workflow provide an invaluable example to future digitisation initiatives. In her data paper, Dr Sendino lists the limited resources she needed to complete the task in just over a year. In terms of staff, the curator was joined by MSc student Teresa Máñez (University of Valencia, Spain) for six weeks while locating the specimens and collecting all the information about them; volunteer Jane Barnbrook, who re-boxed 1,500 specimens working one day per week for a year; NHM’s science photographer Kevin Webb and University of Lisbon’s researcher Carlos Góis-Marques, who imaged the specimens; and a research associate, who provided broad identification of the specimens, working one day per week for two months. Each of the curators for the collections, where the Lyell specimens were kept, helped Dr Sendino for less than a day. On the other hand, the additional costs comprised consumables such as plastazote, acid-free trays, archival pens, and archival paper for new labels. “The success of this was due to advanced planning and resource tracking,” comments Dr Sendino. “This is a good example of reduced cost for digitisation infrastructure creation maintaining a high public profile for digitisation,” she concludes. Committed to open access and open science, the Natural History Museum (London, UK) has launched the Data Portal to make its research and collections datasets available online. It allows anyone to explore, download and reuse the data for their own research. The portal’s main dataset consists of specimens from the Museum’s collection database, with 4,224,171 records from the Museum’s Palaeontology, Mineralogy, Botany, Entomology and Zoology collections.